My recollection of Drive She Said is a little fuzzy. I thought it was a song, a power pop song by Stan Ridgeway. But no, Drive She Said is a melodic rock band formed in 1986 (the same year as the song) by the former American Tears, Touch, and Michael Bolton keyboard player Mark Mangold, and previously unknown vocalist/guitarist Al Fritsch. According to AllMusic.com, "Mangold was also a successful songwriter, co-writing Cher's hit, I've Found Someone, along with Bolton." The released their first self-title album in 1989 to some modest success. 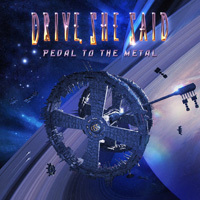 Still active, they return to the Frontiers Music fold with their fifth album, Pedal To The Metal. Don't let the album title twist you up. This is not a heavy metal album, but the title track or Writing On The Wall, which sound a bit like a UFO song, for example, do have some speed. Mostly this melodic hard rock, sometimes with a slight metal edge, but mostly of the AOR variety. DSS is big on beat and groove, but more so with the melody and vocal harmonies. The vocal arrangements are large and dense from many participants. I would call this element, DSS's signature. After these things, there's Mangold's abundant colorful keyboards, whether for accent, atmosphere, or in solo, all of which are mighty prevalent. Which is fine if like your rock more synth centered; it's not always my cup of java. Some lead guitar flavor comes from notable guitarist and producer Tommy Denander. But, fundamentally, mass of synths or not, the arrangements are well-rounded, for instance, with riffs getting weight where necessary and juxtaposed against the keyboard. A fine example is Love Will Win In The End, a true arena rocker where the riffs, groove, and lead guitar solos stand out. Alternatively, as with Rain Of Fire, another song heavier with a metal edge, sometimes you can't quite determine whether keyboards or guitar are leading the solos. Maybe that's the point. Yet, for the ballads, Said It All and In Your Arms, the keyboards have a distinctive presence, like the leading piano in the former song. The conclusion is simple. For classic melodic hard rock, definitely Eighties style, featuring a lively keyboard presence and lavish vocal arrangements, Drive She Said delivers the goods with Petal To The Medal. Recommended. 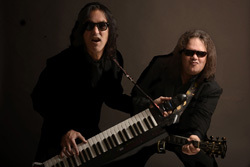 For classic melodic hard rock, definitely Eighties style, featuring a lively keyboard presence and lavish vocal arrangements, Drive She Said delivers the goods with Petal To The Medal. Recommended.